The name of Rhadamanthys, or Rhadamanthus, is not one of the most famous from Greek mythology, but in his own way Rhadamanthys was an important figure, a demi-god whose story intertwined with several other. Rhadamanthys was the son of Europa, and so his story begins with the abduction of Europa by Zeus. In the form of a bull, Zeus would transport Europa to Crete, and on the island, beneath a cypress tree, the god would have his way with her. From the brief relationship three sons were born to Europa, Minos, Sarpedon and Rhadamanthys. Zeus would leave his conquest on Crete, although Europa would soon wed Asterion, the king of Crete, and Europa’s new husband adopted her three sons as his own; and so Rhadamanthys grew up in the royal palace. Eventually Asterion would pass away, and in the most popular version of the story, the three sons of Europa vied to become the new king of Crete, with Minos eventually winning out when Poseidon sent a magnificent bull as a sign of his favour. Rhadamanthys was thought of as being a just king, and one that was popular with the people of Crete. Minos though was jealous of his brother and so usurped him. In either version of the story, when Minos became king of Crete, he exiled his two brothers so that there should be no threat to his position. Sarpedon would travel to Lycia, whilst Rhadamanthys journeyed to Ocalea in Boeotia, where he established a new kingdom. As king of Ocalea, Rhadamanthys would govern in a fair and just way, and his advice was often sought out by others from across ancient Greece. Some stories tell of how Rhadamanthys had already fathered two sons on Crete, possibly by his niece Ariadne. These two sons were Gortys, the eponymous founder of Gortyn on Crete, and Erythrus the Red, found of Erthrai in Asia Minor. In Boeotia though, Rhadamanthys found a new wife, the widowed Alcmene. Alcmene was of course famed for being the mother of Heracles, and some ancient writers would claim that it was Rhadamanthys who taught his stepson how to notch and shoot the bow. Rhadamanthys’ story would continue even after death, for the fairness of his rule in Ocalea, resulted in him being appointed as one of the three judges of the dead in the afterlife, along with the other deceased kings, Aeacus and Minos. In the realm of Hades, three judges would decide how the deceased would spend eternity. 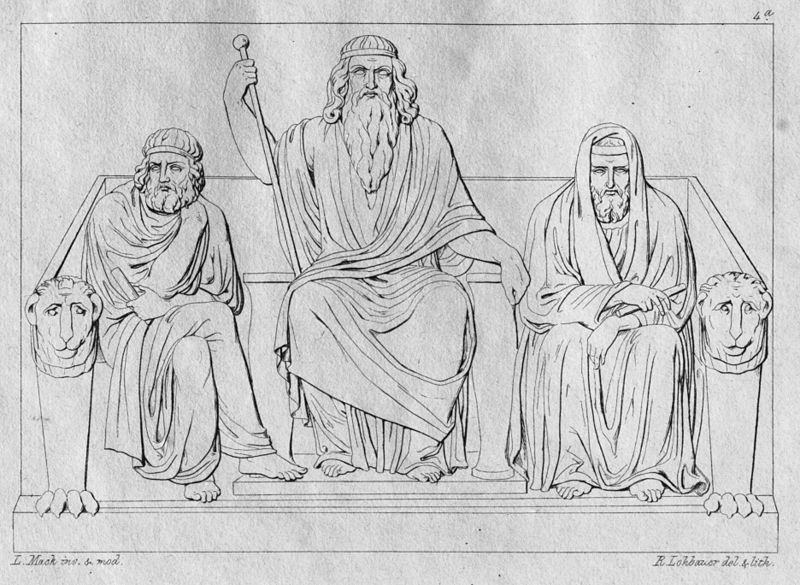 Aeacus was said to judge those from Europe, Rhadamanthys would judge those from the east, and Minos would have a deciding vote if there was a dispute. Thus Rhadamanthys had the power to send someone to Tartarus (hell), the Asphodel Meadows (nothingness) or the Elysian Fields (paradise). Some ancient writers would also tell of how Rhadamanthys was made Lord of Elysium (the Elysian Fields), and so Rhadamanthys would reside with the heroes and righteous of Greek mythology, the likes of Achilles and Cadmus. ​Whether the title of Lord of Elysium reflected Rhadamanthys as being king of the realm is debatable, for if Elysium was paradise, and free from worry and strife, was there a need for a king, and would the residents, many of whom were kings in their own right, take to being ruled over?